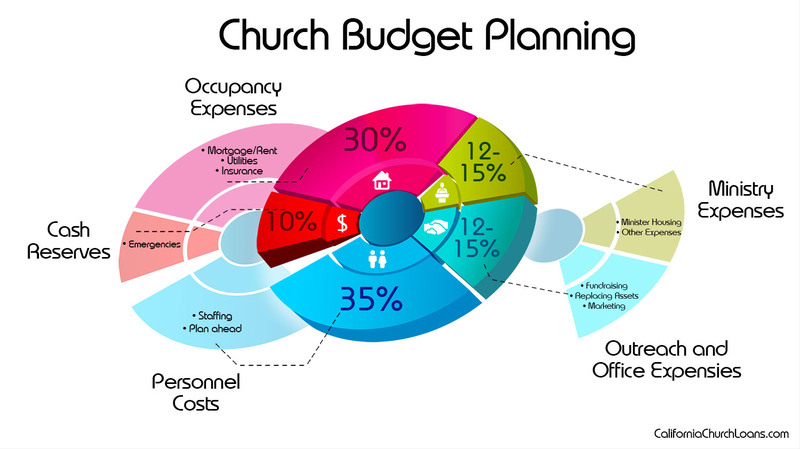 Having a well planned out budget for your church is essential in making sure that you are able to provide your services every month. Just as with any business, you need to properly plan, and check on your budget frequently. Remember that the plan below is a generic outline and may not be perfect for every church. Some larger organizations with thousands of members may require more personnel in order to maintain sermons and keep the doors open. Churches that plan frequent community outreaches, or even provide missionary work, will need to reduce spending in other areas to plan for this increase in spending. Personnel costs are generally the highest expense for churches. This expense can easily range from under 30% of your budget, all the way up to 60%, depending on the organization of your church. While the highest expense, these are generally the easiest to plan for and measure afterwards. You should know and plan ahead the amount of money you expect to pay your personnel every month, and you can easily track this information to get a precise number. Generally speaking, your church should not dedicate more than 50% of it’s budget to personnel, and we have found that 35% is a healthy target for most religious institutions. Occupancy expenses are fairly straight forward and include any mortgage or rent being paid on the property. This would also include any utilities, phone bills, and insurance. Your accounting may have some overlap in this area with office expenses, since I would generally suggest you keep repairs as an expense of occupancy. If your church needs structural repairs and fixes, this should be included in this category (if not an emergency). Other than emergency repairs that may happen over time (which one reason you save 10% in cash reserves), these monthly payments should be known beforehand and will be very easy to track. You do not want to get in over your head with a property that has a rent or mortgage expense that takes up 40% of the incoming revenue to your church. According to what we have seen to work best – you should designate 20 – 30% of your budget to occupancy expenses. This section of your budget could easily be seperated out into two – or even more categories. Outreach may include any and all advertising and marketing you do for your church. It also includes events you may hold such as fundraising efforts. If your church is heavily focused on community outreach, you may need to designate a larger percentage to this section of your budget. Office expenses include any paper and postage that may be needed, or any other office equipment that is required throughout the month. How you want to separate this section from your occupancy expenses is up to you and your accounting, but you generally want to keep repairs separate from these standard monthly purchases. Both of these expenses are much harder to plan and predict for – since they will likely fluctuate. If you decide to do a lot of advertising one month, this expense as related to your budget will increase in percentage. The same is true if you decide to hold an event surrounding a specific holiday – making that month’s expense higher than the rest of the year. Going off of a very generic budget – we suggest roughly 12 – 15% for outreach and office expenses. Depending on the organization of your church, these expenses may vary drastically. While you may pay your personnel in the “Personnel Costs” section, the ministry may still need housing provided. Either with on-site housing or not, this may be a way to reduce overall costs involved by allowing the church to handle these expenses. If the church does not provide housing or other ammenities for the ministry, the “Personnel Costs” section of your budget will surely be higher than our suggested 35%. This is because the ministry will need to be paid this amount instead of it coming out of the “Ministry Expenses” section of your budget. This is definitely the most important and most overlooked section of anyone’s budget. No one can properly foresee emergency expenses, so you need to save for this rainy day – leaky roof scenario. Emergency expenses are almost always more costly than expected. Repairing a leaky roof may cost thousands of dollars. The same is true for plumbing, air conditioning, and pew repairs. You also never know if you may have a down month on the incoming side of your revenue/expenses, making your previous cash reserves savings essential for standard budgetary items. Sometimes – even with proper planning – your expenses may outweigh your revenues at times. Large renovations may cost more than what you have saved up in cash reserves. A balloon payment may be coming up that you will be required to refinance in order to pay off. Or one of countless other scenarios may require your church to seek financing. If this is the situation you are in, BDM might be able to help! Just fill out the contact form below and we will contact you ASAP!